This page is for the original game. For the 2017 remaster, see Turok 2: Seeds of Evil (2017). This original version of the game crashes randomly with multi-core CPUs. Use the unofficial audio CD and multi-core patch to fix this. Unofficial patch for audio CD and multi-core crash fix. Before applying the patch, make a backup of the Video_D3D.dll file in case the modifications go wrong. 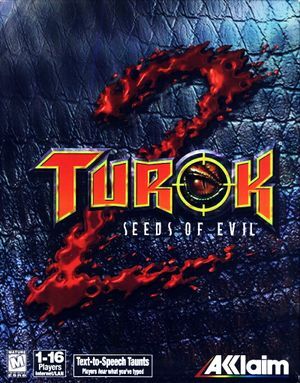 Download turok2fix.exe and run it. Replace 1024 and 768 in the fields with the resolution you want to use (note that for a high resolution, such as 2560x1440, you may need to use dgVoodoo 2. In the game's launcher, use the Options menu option, then the Video menu option and from the Choose a Driver option select the driver that ends with (Direct3D). Press the Properties button and from the Resolution box select 1024x768. If you have Windows 8 or later make sure you also check 32 bit from Render depth. Open the console with ~. Type in set fov x where x is a number between 45 and 90. Use -MaxFramerate 62 command line argument.